It’s what I’ve been exploring and sharing in many ways through the living metaphor of “the intuitive heart.” Here’s a book that is a wonderful demonstration of that evolutionary process, which, surprisingly enough, originates in the mentality of indigenous peoples. 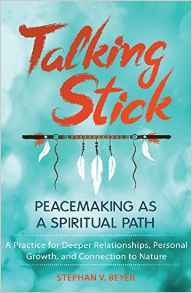 It is Talking Stick: Peacemaking as a Spiritual Path, by Stephen V. Beyer. The author has plenty experience as “a community builder, peacemaker, and carrier of council. He has been trained and certified in many areas of circle processes, mediation, and nonviolence…” according to the back book cover. The talking stick method has been around for a long time among us gringos. I can recall, decades ago, when Eric Utne, the publisher of The Utne Reader introduced the process at a large conference. Little did we know back then how important and vital such a reconciliation process was going to become. What caught my attention about this book was his mention that when King Solomon had his dream where God offered to grant him any wish, his actual reply, when translated correctly from the Hebrew, was not “wisdom,” or “understanding,” but actually “a listening heart.” Given my research on “the intuitive heart,” I couldn’t help but recognize the connection and additional support this book would provide to what I’ve been building and sharing. One of the interesting “boundary breaking” aspects of the sacred circle is the elimination of hierarchies. In a circle, all are equal. When a person holds the talking stick while sharing honestly, and others respond with a “listening heart,” an important archetypal need is met: to be seen, heard, and recognized, with no judgment. A “listening heart” responds not to the literal words, but to the underlying humanity. I can reach out with my heart, connect to your heart, and I begin to discover that your speaking is bringing up within me a mirror of your perspective. The boundary between speaker and listener is dissolved, and in its place is a shared reverence for our humanness. Stephan’s book contains not only instructions on how to create a circle, hold council and listen with heart, but he also describes various applications of the process when folks are wounded and in need of healing, where there has been harm to experience empathy and forgiveness. Many parents would profit from studying what he has to say about how to use an “invisible talking stick” with one’s children. The approach recognizes the dignity and worth of the teenager. I can hear the echoes of Carl Rogers when Steven writes that humans have a need to be in harmonious relations with one another, have the ability for autonomous self-healing and problem solving, and are their own best experts concerning their needs. If we could transcend what he calls our “transactional” approach to relationships, which is more of an economic, capitalist model than a human spiritual one, we’d find we have the abilities to work and create together in ways assumed not possible. I predict we are going to see more on processes of reconciliation that involve “council,” “circle,” and “heart felt dialogue.” The Talking Stick is a great introduction, and a good place to begin, if you wish to be conversant and comfortable with what new ideas the wind is blowing our way. To Explore this book on Amazon.com, click here! People are afraid of conflict: it is something “bad” that must be managed and resolved. In the face of conflict we focus only on facts--who’s at fault and who should be punished--rather than seeking to restore harmony. But conflict is inevitable and presents an opportunity to establish deeper connections with others. By learning to speak honestly and listen devoutly, we can overcome our culture’s hierarchical and punitive approach to conflict. We can learn to relate to each other in a sacred manner and create relationships and communities that are egalitarian, liberating, and transformational. Revealing that we are all peacemakers at heart, Steve Beyer details how to approach life with a listening heart and create a safe and sacred space for communication: the peacemaking circle, centered on the talking stick. Whoever holds the talking stick gets to speak. There are no interruptions, no questions, no challenges, no comments. People speak one at a time, honestly from their hearts, and they listen devoutly with their hearts to each person who speaks. And, as Beyer shows, the effect can be miraculous. The author explains how to apply this practice with groups large and small to deepen relationships, heal old wounds, and restore harmony among families, spouses, classmates, coworkers, and communities. Sharing stories from his work as a peacemaker, he offers exercises for new talking stick circles, ceremonial ways to begin each circle, and tools to ensure the telling of complete stories in cases of conflict. He addresses the nature of apology, forgiveness, and the urge for revenge, and he explores the spiritual challenges faced by those who walk the peace path. Exploring the shamanic roots of the talking stick practice, the author extends the lessons of the healing circle and the listening heart from our homes, schools, and communities into our relationship to spirit and the Earth. There are three simple things that make council special as a way of meeting together, making decisions, solving problems, dealing with conflicts, and building community. Sitting in a circle is the first of these. There are practical reasons for sitting in a circle. Everyone can see everyone else. No one is in front, and no one can hide in the back. But the circle is symbolic as well. The circle indicates the equality of all who sit together. There is no head of the table. Everyone’s voice carries as much weight as the voice of everyone else. Everyone is out front, equally accountable for their words. The world is filled with circles. The sun is a circle; the moon becomes a circle over and over again--that is, in a cycle, a circle. For most of our history, humans have lived, not in the square sharp-cornered containers in which we live now, but rather in circular houses, often explicitly homologized to a circular cosmos. The year and its seasons go in a circle. Our lives go in a circle. We all follow in the footsteps of our elders and teachers who have gone before us; I am getting old now, but I have grandchildren who are coming after me. And the circle binds us to our ancestors. Whoever you are, wherever your people came from, whatever the color of your skin, your ancestors sat in a circle to meet together, make decisions, solve problems, deal with conflicts, and sing the songs and tell the stories that sustained and nurtured their communities. Most important, sitting in a circle creates a special space--a safe space, what many indigenous people would call a sacred space. The council circle takes place in a special space that differs from our ordinary space. In the sacred space of council it is possible to speak honestly without embarrassment; it is a place where confidences are kept; it is where decisions are made and peacemaking takes place. This is the space inside the circle, within which people listen to each other devoutly and give each other the courage to speak honestly from their hearts. This space is very different from the space outside the circle--a space where people interrupt each other, do not listen to each other, are rude to each other. The next time you attend a meeting--a business meeting for example--observe how people behave. People arrive with their opinions already formed, and may carry with them notes of their talking points, so that they do not forget to say something they think is important. People interrupt each other. People shift about impatiently while others are speaking. People do not pause after someone has finished speaking, to show that they are thinking about what that person has said. Instead, people start speaking immediately after someone has finished--indeed, not just when someone has finished, but even when someone simply pauses to take a breath or think about what to say next. The loudest or most aggressive talkers dominate the meeting; shy people may get no opportunity to speak at all. That is how people act out there, outside the sacred circle. But inside the council circle, where we can all see each other, where we take turns speaking, we create a space that is filled with respect and receptivity for what everyone has to say. Inside this circle, we create a sacred space--a space that is safe for speaking, because it is a space for listening. Take a deep breath. Inside the circle, we are home. There are a number of ways to demarcate the separate and sacred nature of the council space. The council may be held in a special place--a grove of trees, by the bank of a river, on top of a large rock, in a cave. A number of classrooms that use council have a peace table in one corner. This special place for peacemaking might also have a way of marking the number of times that the place has seen friendships renewed and breaches healed--marks on a stick, a pile of stones--that makes the table into a place of power. In a circle, too, the gaze of all the participants is naturally oriented not only toward whoever is speaking but also toward the center of the circle. The sacred nature of the circle can be enhanced by making an altar or council table at the center. Making the altar can be a rotating responsibility among the participants, or the altar can be made by those who are moved to do so on any particular occasion. Again, there are numerous variations. The altar can contain flowers, stones, fallen leaves, feathers, or branches that have been gathered before the council. An altar of special significance can be made by each participant placing in the center an object that has personal meaning or that symbolizes the issues to be discussed at council. Or, again, if council is held outdoors and especially for evening councils, the center can be marked by a fire--not the cooking fire, but a special and separate fire. There is something primal about sharing the warmth and light of a fire in the darkness. The glowing fire, the sense of safety, the intimacy and privacy of the darkness seem to lead people to share more of their secret selves than they might do in the harsher daylight. The fire represents a deep and centered place, the heart of everything, the unity for which the circle strives. But most important is this. Any time you listen devoutly to another, you have created a sacred space. The circle exists wherever people hold the intention of sitting in council together. Two people can be in council; you can be in council with yourself. *Excerpt reprinted from publisher’s page, copyright c 2016 byStephan V. Beyer. All Rights Reserved.